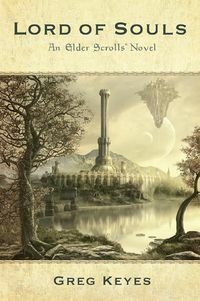 Lord of Souls is the second of two novels written by Greg Keyes that follow the story of The Elder Scrolls (after the events of Oblivion but before the events of Skyrim). The book was published by Del Rey Books, part of the Random House Publishing Group, on September 27, 2011. The shadow of the Infernal City, Umbriel, moves across Tamriel and kills those it falls upon and raises the dead to power itself. Reeling from a devastating discovery, Prince Attrebus continues on his seemingly doomed quest to obtain a magic sword that holds the key to destroying the deadly invaders. Meanwhile, in the Imperial City, the spy Colin finds evidence of betrayal at the heart of the empire—though his own heart may betray him first. And Annaïg, trapped in Umbriel itself, has become a slave to its dark lord and his insatiable hunger for souls. How can these three unlikely heroes save Tamriel when they cannot even save themselves?